Flowers Everywhere! Giveaway Winner Announced! Here’s the book that my readers were trying to win. You gave me a LOT of work to do! This one was very difficult for me. I should just stick to the random drawing. Would make it a lot easier for me to just pull a name out of a hat. But, for the month of May, I wanted to see flowers everywhere. And, I did! I truly enjoyed clicking on every link that was posted. I found some sites I will definitely visit again and some artists whose work I’m going to be following. I narrowed my choices down to 5 – but only 1 can win, right? I loved the looks of the Tulip Field Blanket, but anyone who actually makes that is likely nutso! Or, at least I would be if I tried to make it! So, had to pass on that one. I’m a sucker for snowflakes and this one is great – but more a snowflake than a flower. These booties are beyond adorable! But, not the winner I needed. So, that brought me down to just two. So hard to decide. I end up having to factor in aspects in my own voting that I hadn’t put in the rules. It becomes not just about the flowers, the colors, the yarns. Finally, what always draws me to a winner is the unique quality of the work and, in this case, the combination of artforms. I really tried not to give an edge to a poster’s original work(s) of art, but this month, that was the deciding factor. AND, I wound up with two winners. So, we have a Grand Prize Winner who will receive a copy of the book pictured above and a Runner Up who will receive a book from my library since I have only one copy of this book to give. Here goes! A beautiful way to combine crochet and jewelry. I love bracelets and am especially delighted with the way the crochet designer combined the different elements of flowers and leaves to create this stunning bracelet. What a piece of arm candy! The Grand Prize Winner is this bit of original art that demonstrates all of the elements I was looking for – crocheted flowers and mixed media. I love that it’s an original work of art. But, I also love that it’s a piece that I could reproduce with the information and pictures posted by its designer. Mine might not be a perfect copy. That’s not what I’d want. But, I could make something similar that would work in my decor and would reflect my own preferences in color, texture, etc. This is an original creation of mine. 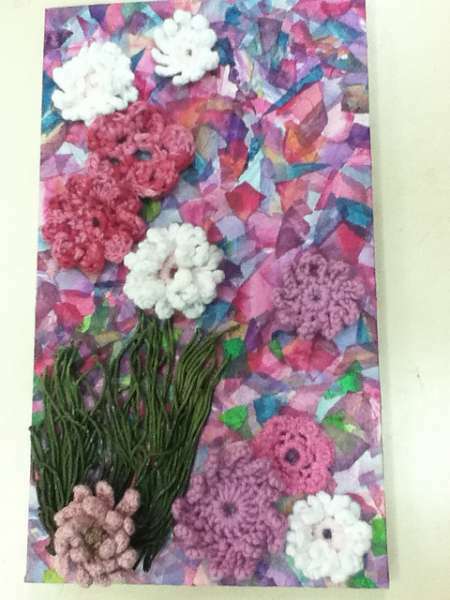 I attached crocheted flowers to a canvas – which I covered with “paper mosaic.” This can be done with any surface, but this one was fun and the flowers looked great on it! Thanks for the giveaway! the book looks amazing!!! I’ll be looking forward to receiving emails from Linda and Deanna so I can send them their prizes. 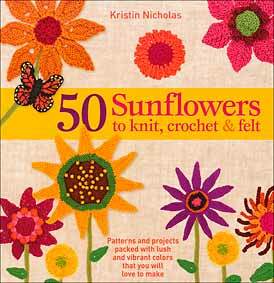 I hope all my readers will click on all the links to see all the creative ways crocheters (and knitters) have used flowers in their work. Perfect for Spring and Summer. Perfect for using up scraps, carry-along projects, gifting, etc. Thanks to everyone who entered and gave me (and all of us) so much inspiration! Visit the original Giveaway post to see all the Comments that contain the links. You’ll have fun!